Written by one of the world’s leading theorists in ecocriticism, this manifesto provides a critical summary of the ecocritical movement. A critical summary of the emerging discipline of “ecocriticism”. Written by one of the world’s leading theorists in ecocriticism. Traces the history of the ecocritical movement from its roots in the 1970s through to its diversification and proliferation today. Takes account of different ecocritical positions and directions. Describes major tensions within ecocriticism and addresses major criticisms of the movement. Looks to the future of ecocriticism, proposing that discourses of the environment should become a permanent part of literary and cultural studies. Lawrence Buell is Professor of English at Harvard University. He is best known for his two previous books on environmental criticism, The Environmental Imagination (1995) and Writing for an Endangered World (2001). His book on Emerson (2003) was also widely admired. 1 The Emergence of Environmental Criticism. 2 The World, the Text, and the Ecocritic. 3 Space, Place, and Imagination from Local to Global. 4 The Ethics and Politics of Environmental Criticism. "Where did ecocriticism spring from? What directions has it taken on both sides of the Atlantic and beyond? What have been its key debates? What are its most radical strands that should take environmentally aware literary criticism into the future? Economically and elegantly, Lawrence Buell develops an astutely judged overview of a richly diverse but crucially important movement in literary studies. 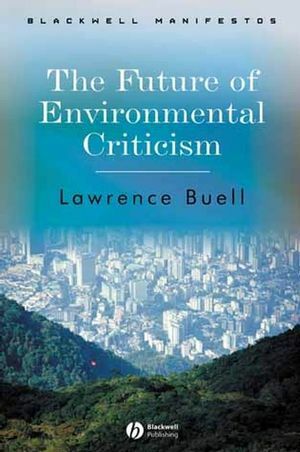 A leading practitioner in the field, Buell reveals how his own work has been influenced by the key debates and identifies the challenges for us all, writers and readers, local neighbours and global species, in facing the future our literary culture mediates and influences." Terry Gifford, author of Pastoral (1999) and The Unreliable Mushrooms (poetry, 2003).